CAN I OBTAIN ABSOLUTE RESULT IN STAIN TREATMENT? Results may vary according to skin type and method applied. The cleaning rate of stains is around 75-90%. The superficial stains are completely cleaned after the treatment. IN WHICH REGIONS ARE THE RESULTS BETTER? Laser spot treatment in all body regions gives good results. Especially the sun and old age spots that cause cosmetic problems in hands and face are treated very successfully. CAN I BE RELIEVED FROM THE SUN SPOTS? Treatment of dark sun spots is easier. In a few sessions almost all of them can be removed. CAN THE PREGNANCY STAINS BE REMOVED? Pregnancy stains are one of the hardest stains of treatment. The superficial ones respond well to peeling and cream treatments. DOES SKIN COLOR AFFECT TREATMENT? Yes. Treatment results are more successful in light-skinned people. Stain treatment is more difficult in dark-skinned individuals. HOW MANY SESSIONS DOES THE TREATMENT TAKE? It is very important that the stains extend up to the level of the skin layers. For this reason, superficial stains (such as cracks, aging spots, sun spots) are usually treated in 2-3 sessions. However, deeper spots are treated in 3-4 sessions. The average number of sessions is 2-4. Session intervals are 2-4 weeks. Treatment results begin to appear after the first session. WHAT ARE THE THINGS TO PAY ATTENTION DURING THE TREATMENT? The most important point is to be protected from the sun. During treatment, it is necessary to use high-intensity sunscreens. WHAT ARE THE ADVANTAGES OF LASER STAIN TREATMENT? CAN STAINS APPEAR AGAIN AFTER TREATMENT? As with all stain treatment methods, in treatment of laser, stain can also be regenerated in the same area after treatment of the stain. However, the following point is very important: In a region where laser stain treatment has been performed previously, the chance of regenerating the stain is lower than in a region without laser application. CAN EVERY LASER BE USED IN EVERY TREATMENT? Each laser cannot be used in the treatment of stains. A laser that can be used in treatment of stains should perform peeling to remove this cell layer, which provides staining for sensitive energy to the melanocytes that provide staining. ARE NON-LASER METHODS SUCCESSFUL IN STAIN TREATMENT? After the stains are evaluated by a specialist doctor, some stains can be removed by special peeling blends, microdermabrasion and pigmentation clear creams. This type of treatment gives results in superficial and new stains and at least 6-8 sessions after administration. However, all these treatments should be done as a result of professional evaluation on doctor’s control. CAN I OBTAIN ABSOLUTE RESULT IN LASER STAIN TREATMENT? The outcome of stain treatments varies according to the type of skin of the patient and the method used. 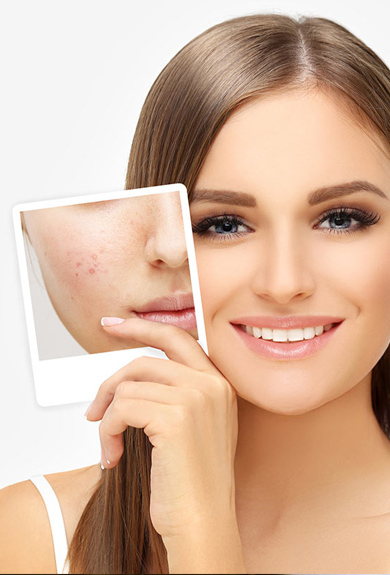 The most effective and quick result is laser treatment, even in freckles called Efelid and in superficial lesions it can be destroyed by laser even if the stains on the stains are too few. CAN I GET RID OF STAINS COMPLETELY? Treatment of dark spots is easier. In a few sessions color becomes seriously lighter. The other advantage is that the skin is light colored. The more superficial the stains are, the better the response is. While sunspots and aging spots respond quickly, pregnancy spots are more resistant.